Bose is a growing name in the audio equipment market; starting from audio speakers at home to Bose truly wireless and Bose noise canceling headphones, they have evolved to gather a vast array of fans with different preferences. They have varied headphones to choose from among which in-ear headphones, on-ear headphones, Bluetooth wireless, Truly Wireless and Bose Noise Cancelling headphones are mention worthy. The noise canceling feature comes to mind before “wireless and wired” because of how popular it is. Especially Bose Noise Cancelling headphones are preferred by music lovers who love sound clarity and depth of music, be it wireless, wired, on-ears or in-ears. With Bose Noise Cancelling headphones, the expectation escalates and yet they manage to keep their customers satisfied. BOSE can be compared to the Kardashians. Love it or hate it, they still do prevail for a reason. Bose noise canceling headphones have been feeding off the people’s love for their noise canceling features. It is very true that one of their prime features is noise cancellation. Bose QC25 noise canceling headphones of the Quiet Comfort series is not an exception to the case. It has a matte finish that makes it look really low toned and classy. The headphone lives up to its name since it gives both noise cancellation and extreme comfort. 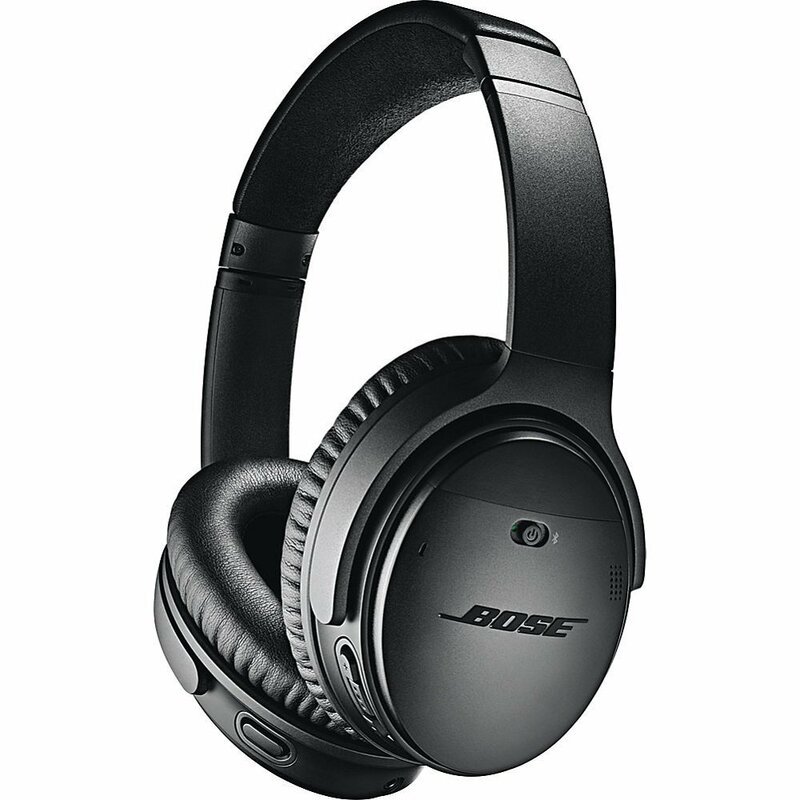 If you are looking for a pair of headphones that will help you concentrate on your work with a flow of indie or mid ranged music on the background, Bose QC25noise canceling headphones is just the headphone for you. Although the look is pretty amazing, the feel of the headphone is not up to mark. It has a rather plastic feel but the memory foam and the nice padded leather make up for it. The headband is made of cotton or suede with a 3 feet cable equipped with 3 buttons. The specs are given below for you to see. Design: Swiveled ear cups enable comfortable to wear with a 90-degree angle adjustment. Noise Cancellation: The level of noise cancellation it provides is from excellent to mind-blowing. Sound: The sound quality lacks pretty much bass and is expected to give the wearer a “relaxed” feel. Battery: Equipped with AAA batteries. Accessibility: Built-in mic and volume control. Lightweight: The pair of headphones, being made of plastic is very lightweight. The pair of headphones offers an optimum level of and ultimate qualities of noise cancellation. The headphone has a really comfortable build and the materials used are of top quality. The pair of noise-canceling headphones is not wireless and this seems a bit outdated. Although the batteries are undoubtedly long lasting, they are not preferred by a whole lot of people. 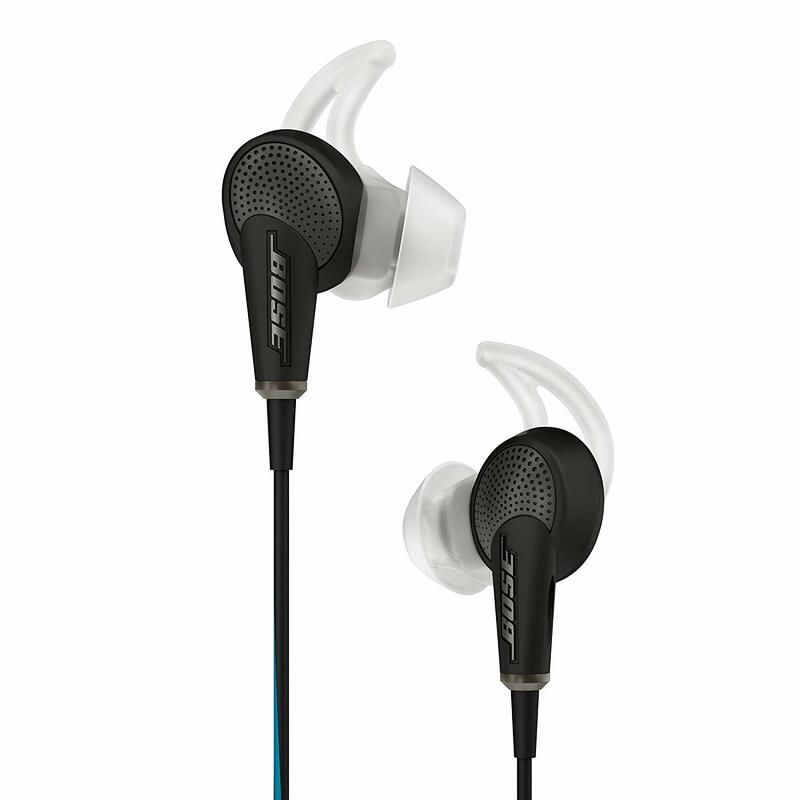 The Bose QC20 noise canceling headphones are a pair designed for in-ear users. They come with a custom in-ear wing design for a superior fit. It is also equipped with a module connected to the earphones. The module has light indicators to show whether your Bose noise-canceling headphones has run out of juice or not. The earphones have a pouch that comes along with the package. It also comes with three comfortable pairs of earbuds. It delivers an all over clean, modern and at the same time, stylish look. 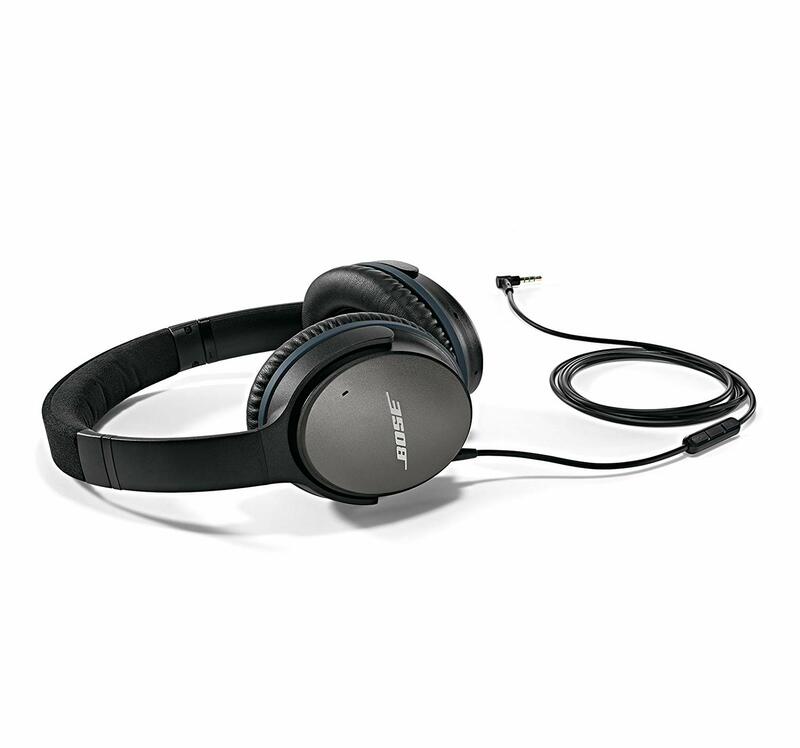 The Bose QC20 noise canceling headphones are very lightweight wear. As far as music is concerned, if you are a bass monster, this will not let you down. In fact, the transition from the lows to the highs is really smooth but it does get overpowered by the high ranged tunes sometimes. The specs are given below for you to see. Elastic Wires: This enables it to absorb strain shocks in an unprecedented situation. Cloth Zipper: The earphones come with a nylon-based cloth pouch for protection. Design: Comparatively bigger earbuds in design with a pair of silver and black colored earplugs. Battery Type: USB Chargeable, built in. Battery Life: It has 16 hours of battery life. Module piece: A 3.5-inch noise cancellation module that enables noise canceling. Sound: The earphones deliver an impressive level of smoothness during playback. The module has an “Aware mode” that quickly enables you to let in some of the surrounding sounds just in case you needed to be aware of your surroundings. Situations like walking on the streets are suited for such modes. It has great appeal to bass music enthusiasts. The control module has an uncomfortable placement and often needs adjusting. The adjustable wings give off a sore feeling when used for a prolonged time. 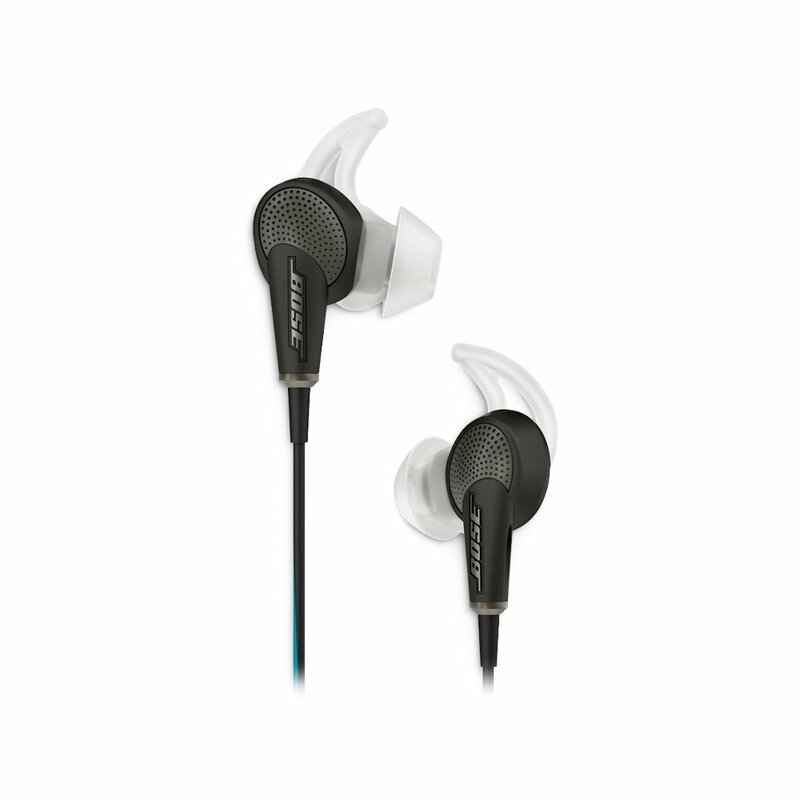 Bose QC20 noise canceling headphones are designed for in-ear headphone lovers. The users of in-ears are increasing starting from Android to iOS. 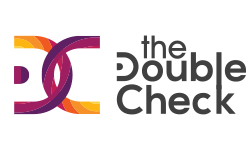 Thus, QC20 has not left out iOS users. They have a pair of in-ear silicone wings to keep the earplugs in place. 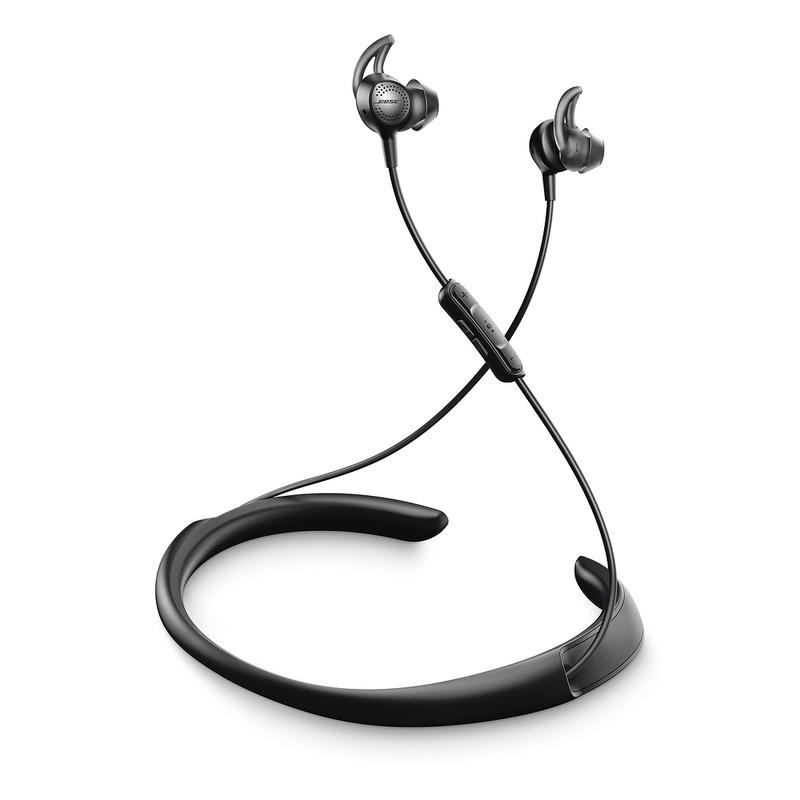 A rubber-padded module with the earphones packs in some extra features. Light indicators on the module show charge levels of your Bose noise canceling headphones. The earphones come with a pouch. The Bose QC20 noise canceling headphones have three pairs of earbuds. This one too has an overall clear, sophisticated and customized look to go with Apple devices. The earphones are very lightweight. As far as music is concerned, if you are a fan of perfect audio as to expect from your Apple earphones, this one is no less. In fact, the transition from the lows to the highs is really smooth but it does get overpowered by the high ranged tunes sometimes. The only difference between the Android version and this version for iOS is that it is equipped with two additional buttons for iOS functionality. The specs are given below for you to see. Elastic Wires: This enables it to absorb strain shocks. Cloth Zipper: The earphones come with a nylon-based cloth zipper pouch for protection. Module piece: A 3.5-inch noise cancellation module that enables noise cancelling. The module has an “Aware mode” that customizes ANC. It has great appeal to your bass music. The control module has an uncomfortable placement and often needs setting to the body for a firmer keep. The successor that suits the Bose QC20 noise canceling headphones from the Bose noise canceling headphones lineage is the Bose Quiet Control 30 wireless earphones. They come with a sleek neckband that has a rubbery surface which adds up altogether to the grip around the neck. At the same time, it delivers an all-around premium matte look. Packed with interchangeable silicone earbuds, these headphones are an easy fit for your ears. They still do not come around as a firm gripping earphone piece when used for sports purposes. Moreover, this pair of Bose noise canceling headphones lack one of the conventional features that earphones of this design portray which are the magnetic tips. These enable the user to wear the earphones around the neck and keep it in place. When it comes to sound, they are pretty decent and can be somewhat compared to Bose QC25 noise canceling headphones. Design: The design is pretty premium with easy fitting headphones. Call Quality: The listener has a pretty good ANC feature but the speaker on the other side picks up background sounds. Battery life: The earphones have an impressive battery life of 10 hours. Noise Cancelling: It mostly cancels out all the external noises. It can connect to three devices altogether. A single slot can pack in two devices and maintain connections simultaneously. The lows and below mid tunes tend to give off a static hiss. Although the neckband is made rubbery for better grip. This earphone not sink in on your neck and stay in place. Bose has been targeting a wide range of customers for a very long time. They even manage to keep up with the expectation of Apple users with their range of Bose noise-canceling headphones. Not to mention, keeping their prime goal of focusing on keeping their features of noise canceling intact, they have an iOS version. Equipped with a matte finish, the product perfectly suits the look of your headphones with the iOS devices. The headphones, even in this version lives up to its expectation of comfort and noise cancellation. If a pair of headphones that will enable a smooth music playback in the background without any sort of interruption is your style of music listening, then Bose QC25 noise canceling headphones is your suitable pick, even for Apple devices. The headphones have an amazing look and are equally decent when it comes to touch and feel. Although the plastic feel makes you have other opinions, the luxurious memory foam and leather padding make up for the inconveniences. The headband is made of cotton or suede with a 3 feet cable equipped with 3 buttons. The main difference is in this 3-feet wire made compatible with Apple devices. Design: Swiveled ear cups enabled comfortable to wear with a 90-degree angle adjustment. Noise Cancellation: The level of noise cancellation it provides is excellent. The headphones have a really comfortable build. The pair of noise canceling headphones not being wireless seems outdated. The batteries are undoubtedly long lasting but they are not preferred by a whole lot of people. Bose Quiet Comfort 35 noise-canceling headphones comes with a wireless feature with a fusion of Bose’s Noise Cancellation and comfort. This pair of Bose noise canceling headphones is pretty much a follower of the Bose QC25 noise canceling headphones but with a lot of better features. It has a noise cancellation button on the outside of the ear. Just slide the button to the middle and hear the world mute out of existence. In fact, it has a built-in battery that is USB chargeable. It lasts for 20 hours in Bluetooth mode and just when you turn it off, the juice stays longer. Moreover, it comes with an airplane adapter packed in its hard-shell case. The case of comfort is in the name itself. It is extremely lightweight with extremely comfortable foams inside the earcups. It basically packs in a lot of usage time without irritation. The sound is pretty decent considering that it can differentiate the instruments from the vocals clearly. They are give you comfort in case of ease of access with NFC for easy pairing. The specs are given below for you to see. Wireless: The pair of headphones is wireless made possible by Bluetooth. Noise Cancellation: The noise canceling features are undoubtedly excellent. Battery Life: It has a battery duration of 20 hours with Bluetooth on. Battery Type: It has a built-in battery that is USB chargeable. Design: The color tones give off a premium vibe that you will want to show off. Comfort: The QC35 has a leather covered headband. Sound: The treble is excellent and the highs and lows sync in perfectly even with the Bluetooth mode. NFC: They are NFC enabled. The main selling point is the wireless feature for these headphones. It has a pretty monstrous battery life spanning a 20+ hours duration. The mids are compromised with reports of a bit less rich bass. The price tag on these headphones is too expensive for many. 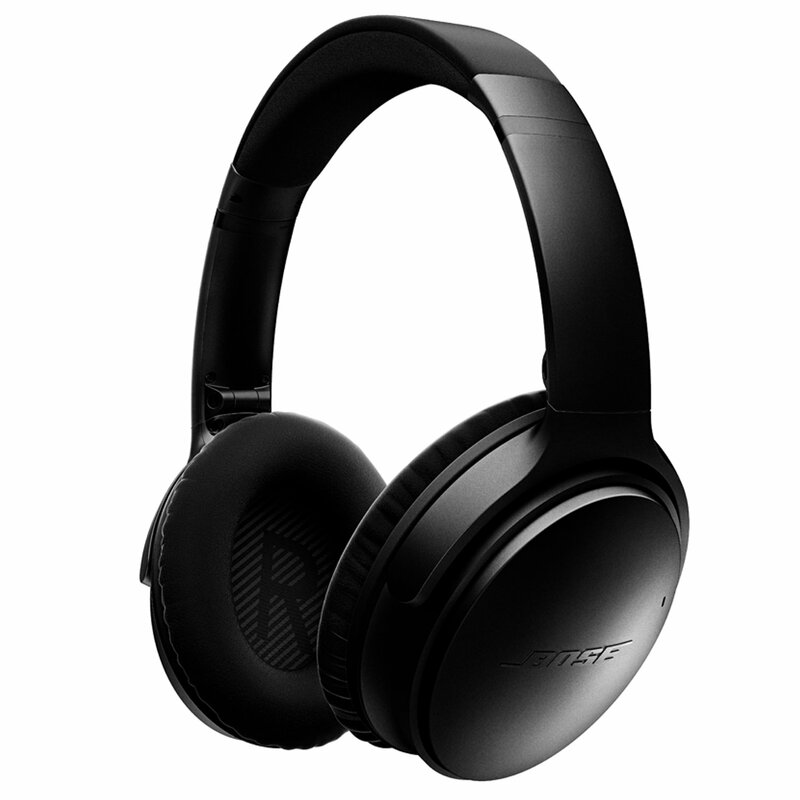 When it’s been almost a year that the Bose noise canceling headphones have made a pair for the QC series, Bose Quiet Comfort 35 noise-canceling headphones II comes in with loads of new features with a fusion of Bose’s Noise Cancellation and comfort. A noise cancellation button with voice assist gives it an interactive feel. You can basically feel the surroundings fade out. It lasts for 20 hours in Bluetooth mode with quick charge technology. Moreover, it has the latest feature on the left ear, the Google Assistant button. It is extremely lightweight with comfortable foams inside the ear-cups. These are lighter than the Bose Quiet Comfort 35 noise-canceling headphones. The sound is pretty decent considering that it can differentiate the instruments from the vocals clearly. Google Assistant Access: The pair of headphones comes with a Google Assistant button. Battery Life: It has a battery duration of 20 hours with Bluetooth on, more without. Design: The color tones give off a premium vibe. Sound: The treble is excellent. The highs and lows sync in perfectly even with the Bluetooth mode. They have a fast charging mechanism. The compromised mids and a bit less rich bass still remain unchanged. The USB used is 2.0 and not a USB type-C, which is a disappointment for the year released. Bose, among all the others, always has something unique to pack and provide in its next gadget. Starting from huge battery lives to saving 3 devices and being able to connect two devices simultaneously in a profile, Bose has done it all. They might cost a bit higher than the others, but well, every feature that they pack does pay off. 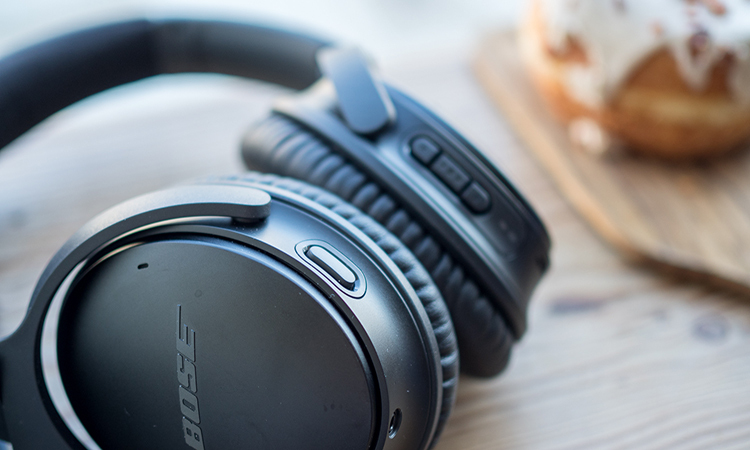 Bose always keeps comfort and noise canceling features as a top priority. It always maintains its lowkey and stylish matte look no matter what. Thus, these are some of the headphones that you should be thinking to get your hands on.